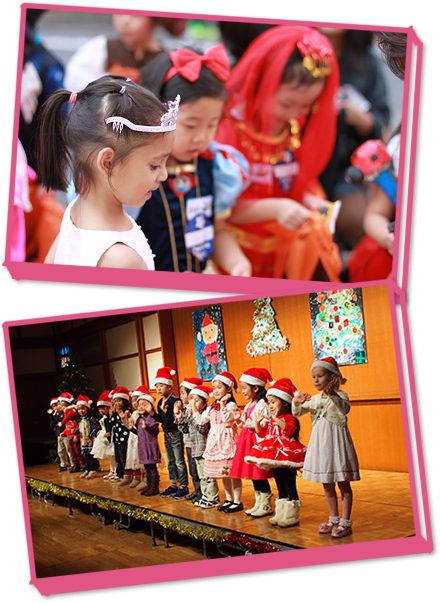 We offer 4 to 6 hours of English preschool for children aged 2 to 4 years. Children can join 2 to 5 days a week. In the Preschool Program, we aim to develop independence and cooperativeness as well as intellectual and physical ability in a well-balanced manner. In order to develop communication skills in English, the children have lessons incorporating phonics, songs and movement as well as fun activities such as crafts, outdoor play and seasonal events in English. Children learn how to keep to the rules in a group and become able to do things by themselves. Each class has a capacity of 12 children and English -speaking teachers, who are experienced in early childhood education, take care of them attentively. Sibling discount does not apply to preschool program. It cost 10% of the monthly fee to take a leave of preschool. 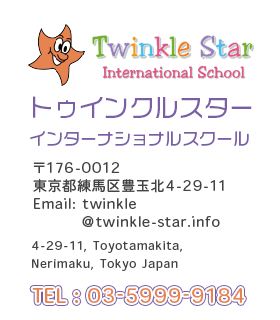 If you wish to enter our Kindergarten from preschool, there is an entry screening. Please pay the difference of registration fee when entering Kindergarten.